I was doing research for today’s blog post and stumbled across this one instead. Of course there are naysayers to this, claiming among other things that human cells were in existence long before Jesus was crucified on a cross. But that misses the point, if God can create worlds through His will, if He can make blind men see and lame men walk…doesn’t it reason that He kinda knew about the coming of the Cross in advance? Anyway, it is an act of faith to belief, and in the case of biochemistry, an act of the science of God. Reblogged from One More Soul ministries. A couple of days ago I was running (I use that term very loosely) on my treadmill, watching a DVD sermon by Louie Giglio…and I was BLOWN AWAY! I want to share what I learned….but I fear not being able to convey it as well as I want. I will share anyway. He (Louie) was talking about how inconceivably BIG our God is…how He spoke the universe into being…how He breathes stars out of His mouth that are huge raging balls of fire…etc. etc. Then He went on to speak of how this star-breathing, universe creating God ALSO knitted our human bodies together with amazing detail and wonder. At this point I am LOVING it (fascinating from a medical standpoint, you know.) …..and I was remembering how I was constantly amazed during medical school as I learned more and more about God’s handiwork. And then I lost my breath. And it wasn’t because I was running my treadmill, either!!! It was because he started talking about laminin. I knew about laminin. Here is how wikipedia describes them :”Laminins are a family of proteins that are an integral part of the structural scaffolding of basement membranes in almost every animal tissue.” You see….laminins are what hold us together….LITERALLY. They are cell adhesion molecules. They are what holds one cell of our bodies to the next cell. Without them, we would literally fall apart. And I knew all this already. 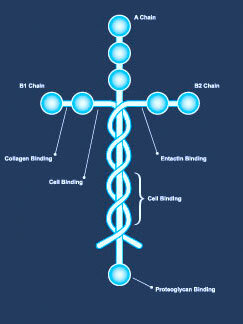 But what I didn’t know is what laminin LOOKED LIKE. But now I do. And I have thought about it a thousand times since (already)…. The glue that holds us together….ALL of us….is in the shape of the cross. You would never in a quadrillion years convince me that is anything other than the mark of a Creator who knew EXACTLY what laminin “glue” would look like long before Adam even breathed his first breath!! And Now For Something Completely Different, Apologetics, God's View vs. World View, Guest Blogs, What Is Truth? My husband and I watched this a few months ago and shared it with our church family. An awesome video. God is amazing! The answer people are looking for is not only all around us, it’s IN us! GORGEOUS gravatar picture!!! I’m into scenic photography ,also. Particularly, sunsrises and sunsets!! Thanks. It is on the US eastern coast. Was visiting there a few years ago. What a great trip – and beautiful as well. Blessings on your day and thanks for the shout out and the reblogs! THIS NEEDS TO BE VIRAL!! !